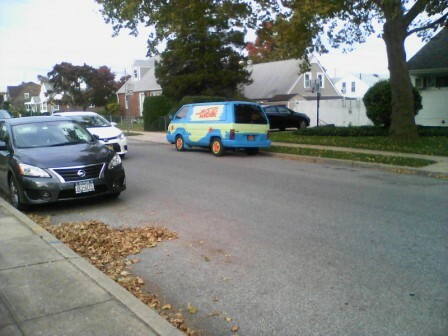 Walking over, I saw a rather beautiful woman, a little younger than me… I had presumed the van had been built by a gentleman who puts on a rather extravagant Halloween show every year in the neighborhood. But she explained to me that the car actually belonged to her son, who lived about a half hour away, and sometimes came to visit with his daughter. The granddaughter, it seems, is a terrific Scooby Doo fan, and her father customized the vehicle as a happy treat for both of them! 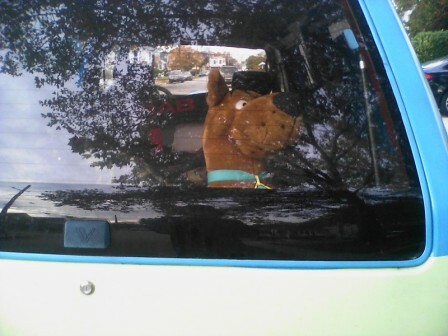 While there was no Velma, Shaggy, Fred or Daphne in sight, I did take note of one familiar friend, in the back seat. 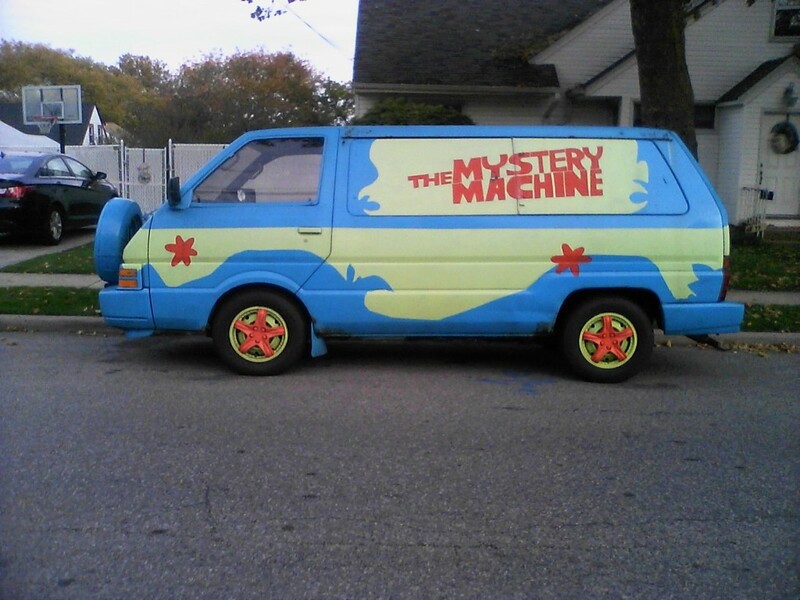 This entry was posted in Skiffy and tagged James H. Burns, Scooby Doo by Mike Glyer. Bookmark the permalink. This father wins the internet. I have a colleague whose new car (it’s one of those square blocky ones) is being customized to look like the tardis (he is a major Dr. Who fan!). And just have to drop a link to this brilliant Livejournal Post on “SJW Stuff” (that so complements Scalzi’s post about lowest level of difficulty explanation). First, you’ve got your Social Justice Warriors. Their job is to draw aggro, so they need heavy tanking armor. The best tanking armor is White Privilege, which means that, honestly, Cis Het White Male is actually a good race for SJW. Thick Skin is necessary, too. You really need visibility to make your Taunts work well, so you need a very public persona to draw aggro well. Chris Kluwe and John Scalzi are two examples of effective Social Justice Warriors. Back when the Plymouth Voyager mini-van first came out, Kandy and John Fong had theirs customized to look like the ST shuttle Galileo. Since they lived only about half a mile from us, I’d see in not-infrequently at the grocery store and other local spots. (and I LURVE her “BOth Sides Now” video).